Edmonton Aerial Lift Safety Training - There are around 26 to 30 construction fatalities within North America due to the use of aerial lifts. Nearly all of the individuals killed are craftsmen like electrical workers, laborers, painters, carpenters or ironworkers. The majority of the deaths are caused by falls, tip-overs and electrocutions. The greatest risk is from boom-supported lifts, like for instance bucket trucks and cherry pickers. Most fatalities are connected to this particular kind of lift, with the rest involving scissor lifts. Other dangers include being struck by falling things, being thrown out of a bucket, and being caught between the guardrail or lift bucket and a thing, like for example a joist or steel beam. The safe operation of an aerial lift needs an inspection on the following things before using the device: operating and emergency controls, safety devices, personal fall protection gear, and wheels and tires. Check for possible leaks in the air, hydraulic fluid and fuel-system. Inspect the device for missing or loose parts. The areas where worker will use the aerial device must be examined thoroughly for possible dangers, like for example bumps, holes, debris and drop-offs. Overhead powerlines need to be avoided and monitored. It is recommended that aerial lift devices be utilized on surfaces that are stable and level. Do not work on steep slopes that exceed slope limits which the manufacturer specified. Even on a level slope, outriggers, brakes and wheel chocks must be set. Employers are required to provide aerial lift operators and maintenance mechanics with the proper guidebooks. 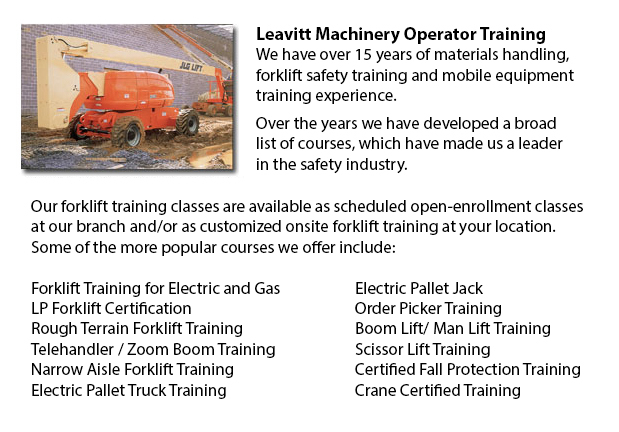 Mechanics and operators must be trained by a certified person experienced with the relevant aerial lift model. o Prior to operating, close lift platform chains and doors. o Do not lean over or climb on guardrails. Stand on the floor of the bucket or platform. o Make use of work-zone warnings, such as cones and signs, when working near traffic. If correct procedures are followed, electrocutions are preventable. Stay at least 10 feet away from whichever power lines and qualified electricians must de-energize and/or insulate power lines. Workers have to use personal protective equipment and tools, like insulated bucket. Nevertheless, an insulated bucket does not protect from electrocution if, for instance, the worker touches another wire providing a path to the ground. When inside the bucket, workers have to prevent possible falls by securing themselves to the guardrails by utilizing a full-body harness or a positioning device. If there is an anchorage inside the bucket, a positioning belt with a short lanyard is acceptable. By following the manufacturer's instructions, tip-overs can be prevented. Never drive the lift platform while it is elevated, unless the manufacturer specifies otherwise. Follow the device's vertical and horizontal reach limits, and never exceed the specified load-capacity.